The Friends of ACU Library will host former First Lady Laura Bush as featured speaker at its spring fundraiser. 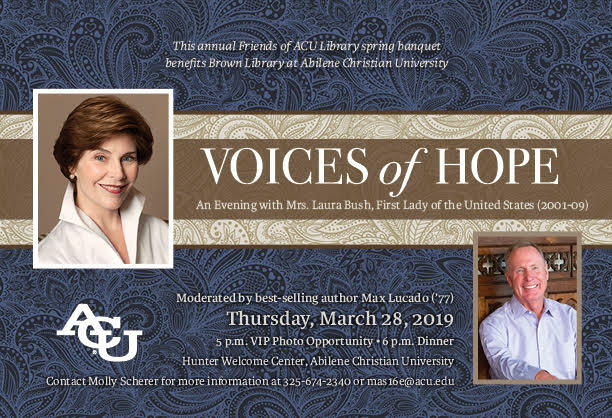 “Voices of Hope: An Evening with Laura Bush” will begin at 5 p.m. March 28 at Hunter Welcome Center and will be moderated by best-selling author and ACU alumnus Max Lucado (’77). The event takes its name from We Are Afghan Women: Voices of Hope, a book about women’s rights in Afghanistan recently released by the George W. Bush Institute, with an introduction by Mrs. Bush. After leaving the White House in 2009, President and Mrs. Bush founded the George W. Bush Presidential Center in Dallas. The center is home to the Bush Presidential Museum and Library and the George W. Bush Institute, a public policy center established to solve today’s most pressing challenges by developing leaders, advancing policy, and taking action. Mrs. Bush is an advocate for literacy, education and women’s rights and was recently named Texan of the Year by the Dallas Morning News. Lucado serves as a preaching minister of Oak Hills Church in San Antonio, and his best-selling books have sold 100 million copies across 54 languages worldwide. His newest book, Unshakable Hope: Building Our Lives on the Promises of God, was released in August 2018. Funds raised through sponsorships of the event will support Brown Library, specifically a renovation of the top floor to create ACU Library Forum, a flexible meeting space that overlooks the Campus Mall. For more information about the event or sponsorships, visit acu.edu/laurabush. In the past year, I have been actively involved in the donation of rare books from the collections of my deceased Aunt Virgie Massey Gray, Uncle Elmer J. Gray and Mother Bonnie Massey Cook. This has not only been a very rewarding project for ACU as recipient but for me as donor. The event featuring Mrs. Laura Bush will definitely be yet another memorable event benefitting the ACU Library Program. What a nice compliment to ACU for having Laura Bush.